#365 Gratitude Day 190: Shared humor with my wife — No starting. No stopping. Only doing. Missy and I are both giant dorks. We love video games, wearing matching t-shirts, and lolcats, also known as cat macros. 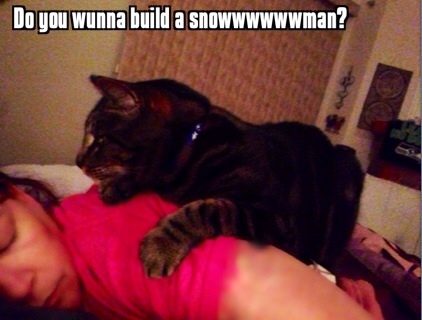 One thing we do from time to time is take funny pictures of our cats, and then make them into our own cat macros. Here's a funny one that happened just this morning. I eat this stuff up. I love that Missy is my dork buddy. One of the very best parts of being married to her is reveling in our shared odd humor. I'm grateful we make each other laugh, loudly and often.